Annual Bedstraw, Cleavers, Common Cleavers, Goose-grass, Stickywilly, Stick-willy: Galium aparine (Synonyms: Galium agreste, Galium agreste var. echinospermum, Galium aparine var. aparine, Galium aparine var. 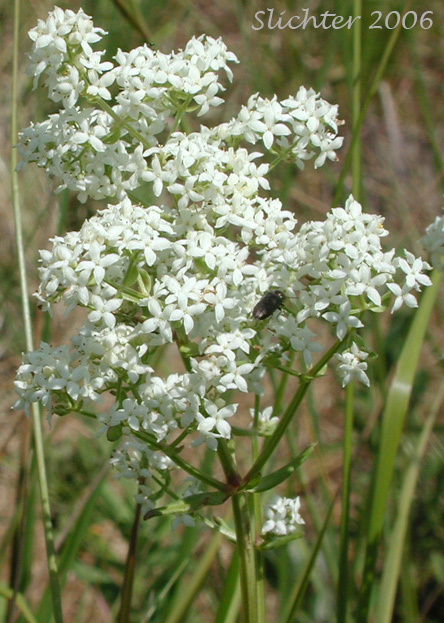 echinospermum, Galium apraine var. vaillantii, Galium vaillantii) - Leaves 5-8 per whorl, the blades very narrow and 10-15 mm long. Herbage of hooked hairs on leaves and stems that are like "velcro". Fruits with hooked hairs. Annual. Low Mountain Bedstraw, Twin-leaf Bedstraw: Galium bifolium - Leaves 2-4 per whorl, the upper opposite on the stems, the lower unequal in whorls of 3-4. Flowers solitary from the leaf axils. Fruit with hooked hairs. Perennial. Northern Bedstraw: Galium boreale (Synonym: Galium boreale ssp. septentrionale) - Leaves 4 per whorl. Flowers white in a dense, branched inflorescence at the top of the stem. Hairs on the fruits straight, not hooked. Perennial. Rough Bedstraw, Tall Rough Bestraw: Galium mexicanum var. asperulum (Synonyms: Galium asperrimum, Galium mexicanum ssp. asperulum, Galium filipes, Galium mexicanum var. asperrimum) - Leaves 6-8 per whorl (but very unequal), the leaves wider in the middle than at the ends. Flowers white, 3 or more per leaf axil in a widely spreading, irregularly-branched inflorescence. Fruit with hooked or straight hairs. Perennial. Intermountain Bedstraw, Serpentine Bedstraw: Galium serpenticum (Synonyms: Galium bloomeri, Galium serpenticum ssp. dayense, Galium serpenticum ssp. malheurense, Galium serpenticum ssp. okanoganense, Galium serpenticum ssp. puberulum, Galium serpenticum ssp. scabridum, Galium serpenticum ssp. warnerense, Galium serpenticum ssp. serpenticum, Galium serpenticum ssp. wenatchicum) - Leaves 4 per whorl. Flowers yellowish or greenish and numerous but not in a conspicuous inflorescence. Perennial. Small Bedstraw, Three-petal Bedstraw: Galium trifidum (Synonyms: Galium brandegei, Galium cymosum, Galium tinctorium, Galium trifidum ssp. columbianum, Galium trifidum ssp. pacificum, Galium trifidum ssp. subbiflorum, Galium trifidum var. pacificum, Galium trifidum var. pusillum, Galium trifidum var. subbiflorum, Galium trifidum var. tinctorium) - Leaves 4-6 per whorl, the blades very narrow and 7-12 mm long. Fruits hairless or with straight hairs, not hooked. Perennial. Fragrant Bedstraw, Sweetscented Bedstraw, Three-flowered Bedstraw: Galium triflorum - Leaves 5-6 per whorl, the leaves wider in the middle than at the ends. Flowers greenish with 1-3 from the leaf axils. Fruit with hooked hairs. Perennial. Kelloggia, Milky Kelloggia: Kelloggia galioides - Leaves all opposite. Flowers long pedicellate in a loose inflorescnece. Corolla 4-8 mm long, pink or white in color, and funnel-shaped. Perennial.